Northamptonshire Head Coach David Ripley was left frustrated but admitted the umpires made the right decision after his sides match against Leicestershire at Grace Road was abandoned in near darkness 3.1 overs into the second innings. After a delayed start and a further 90 minutes delay eight balls into the contest, the match was reduced to 11 overs a side, Ben Duckett’s unbeaten 39 taking Northants to 98-3. 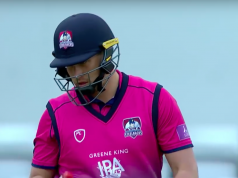 Chasing a D/L adjusted 101, Leicestershire had reached 25/1 from three overs in almost farcical conditions, but when Mohammed Azharullah bowled Kevin O’Brien with the first ball of the fourth the umpires decided they had seen enough and abandoned the contest. The Northants players were clearly not happy with the decision but head coach Ripley said he understood the call, despite being frustrated with his side well on top. 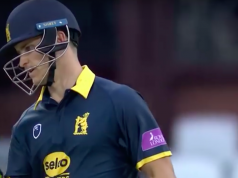 “Frustrating, we obviously get within 11 balls of a result, I felt the wicket had edged it our way but there was no doubt about It, it was dark,” Ripley said. “It was wet, it was dark, it wasn’t summer t20 cricket as we’d like to think of it. 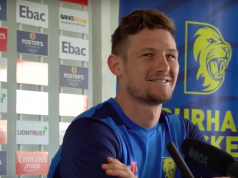 “I understand the umpires coming off I don’t think it was fit for cricket at the end there, but I guess our personal frustration is I felt 17 off 11 balls [to reach D/L par] and with a new guy coming in I thought we were just ahead and if we get those 11 balls I think we would have been ahead. The light had been far from perfect from the resumption from the rain break at 7:20pm and continued to deteriorate throughout the Northamptonshire innings on a merky Leicester evening. From the start of the Leicestershire reply 50 minutes later, Northants fielders were clearly struggling to pick up the ball in the field, Ned Eckersley edging the first ball to Alex Wakely who just about hung on at slip. Mark Cosgrove and Kevin O’Brien made their way to 25/1 at the end of the reduced Powerplay as the light faded further and when O’Brien was comprehensively bowled by a fast straight delivery from Azharullah, the umpires decided conditions were too dangerous, even by the generous standards normally applied in t20 games. After evening rain caused an initial ten minute delay, Richard Levi had survived a claimed low catch at slip from the first ball of the match, Jigar Naik claiming the catch but the umpires ruled it hadn’t carried, before rain returned to force the players off after seven balls with Northants 8/0. After a 90 minutes delay play resumed, Levi and Josh Cobb taking the score to 31 before Shiek removed both of them caught by Tom Wells at mid-on, Levi a fine effort on the run before a simpler chance to remove Cobb on his return to Grace Road.